A few weeks ago, our friend traveled to Dobbiaco, a city in the South Tyrol region of Italy. It’s often called the “gateway to the Dolomites,” a section of the Italian Alps. It’s an interesting region because it’s has established a certain level of regional autonomy in Italy, and many people from this area consider themselves Austrian instead of Italian, even though, by birth, they’re Italian citizens. They also speak German instead of Italian. 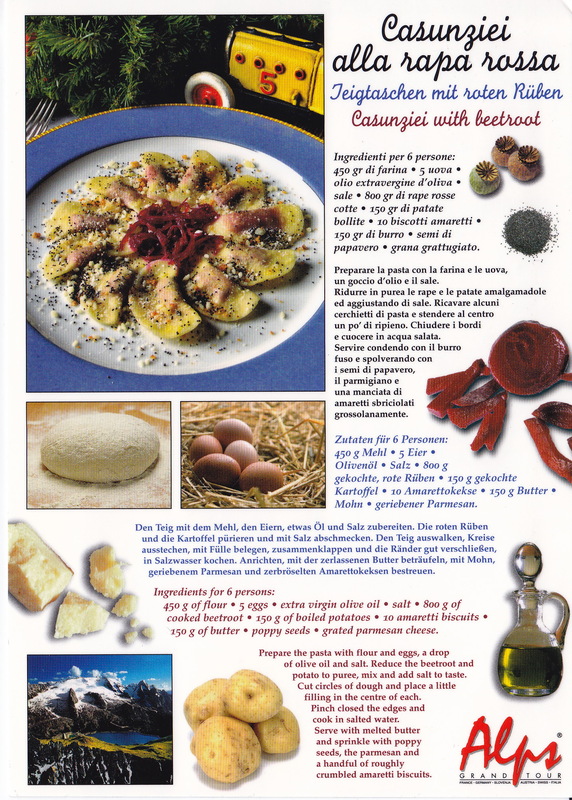 Our friend found two postcards with recipes from the region that I wanted to share. You’ll notice that the food is much more Austrian than Italian. One is for a dessert very similar to the funnel cake in the U.S. and the other is a type of potato dumpling that reminds me of a pierogi filled with a beet purée. Enjoy! This entry was posted in food, Italy, recipe and tagged Alps, dessert, Dobbiaco, Dolomites, Italian, Italy, pierogi, postcard, potato, recipe, South Tyrol. Bookmark the permalink.